Put refreshing cool breeze or soothing warmth (heat pump models) in every room in your home. Now you can hook up multiple units to feed from one powerful inverter controlled compressor. It’s never been easier or more energy efficient. With just one outside compressor unit, you can get up to a 16 SEER energy consumption rating. With our “Flexi-Multi Joint” installation system, these units are easy to install whether your needs are for your home, a business or some type of institutional facility. 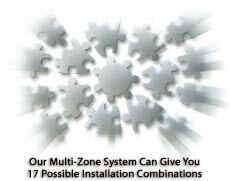 You have up to 17 installation combination possibilities. Whatever your needs are, our system has up to 17 possible installation options to ensure that you have an the ideal setup that will suit your demands and satisfy your facility requirements. You can mix and match evaporators and condensors to get your optimal and desirable result. You can do the classic 2:1 or a 4:1 setups or get creative and come up with your own combinations. 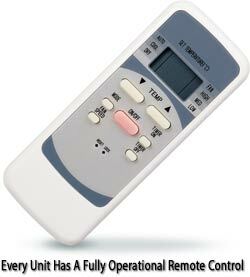 Every room can have its own specific setting as there is a fully operational remote for all evaporators. Each multi-zone wall unit has the same benefits as our single-zone units! All our multi-zone systems have the same features and benefits of our single-zone units. With a push of a button you can command the room’s unit to initiate your desires and relax while the unit does its work. Every wall unit has the jet thrust, turbo fan for super fast cooling! And, you still get the jet-thrust turbo fan mode on every inside evaporator that can cool a room in a fraction of the time a convential system will take. 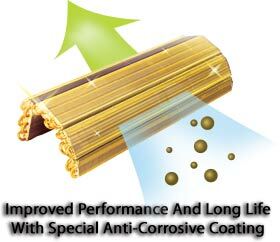 Our manufacturer coats the evaporator coils with a special golden layer that is an anti-corrosive compound that improves the hydrophilic (water enhancing properties) performance of every unit in your dwelling. 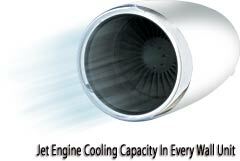 Not only does this improve the performance of your units, it also ensures that your air conditioner has longer life. You also get the superior temperature balance in every room that inverter technology allows. Every member of your household or firm can adjust the temperature to his or her specific desires. This will lead to a more rewarding life and better production from employees if used in a commercial setting. 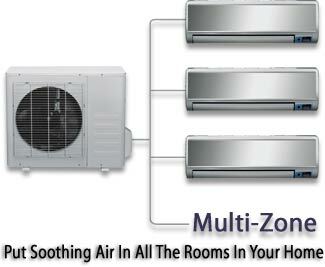 Our inverter multi-zone systems are ideal for your cooling needs and heating if you prefer the heat pump models. They are easy to install and have the smoothest, quietest operation on the market today. You will enjoy many years of relaxing, trouble free comfort with our systems… check us out, you will be pleased!